Fenton made Ivy Overlay from 1949-53. 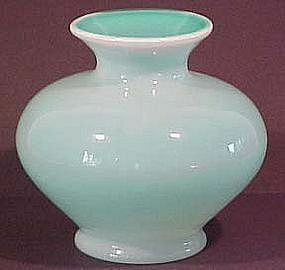 This vase is 7" tall (the largest in this shape--they made a smaller one, 5.5", also listed) and is in mint condition. 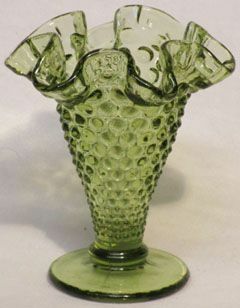 Fenton made cased ivy green items in the 1950's. 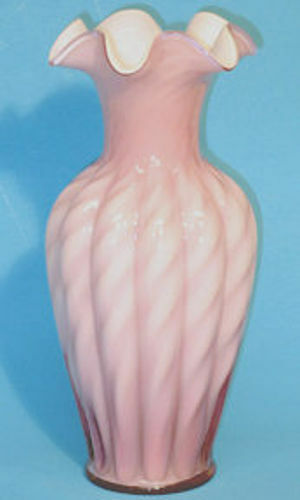 This slender 8" tall vase is in excellent condition. Fenton's Champagne Pink, lightly irridized, 8" leaf tray is in mint condition. Produced after the year 2000, it does have the logo on the underside. 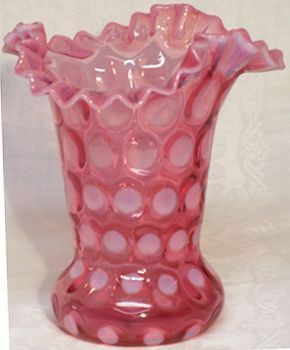 Fenton Coin Spot 9" Cranberry Opalescent Vase is in mint condition. Made in the late 1940-50's. 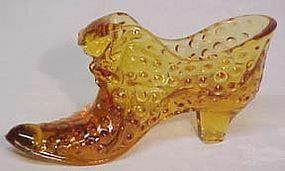 Fenton made this Colonial Amber Hobnail Slipper in the early 1960's. In mint condition. 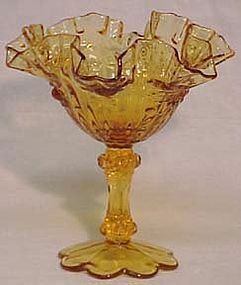 Fenton made Colonial Amber Rose from 1966-70. It stands 6.5" tall and is in mint condition. Fenton Colonial Amber Thumbprint 10 oz. 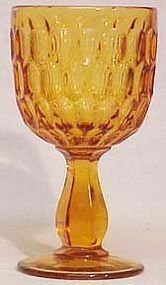 goblet was produced from 1969-74. It measures 6.5" tall and is 3.5" across the top. In mint condition. Three are available. 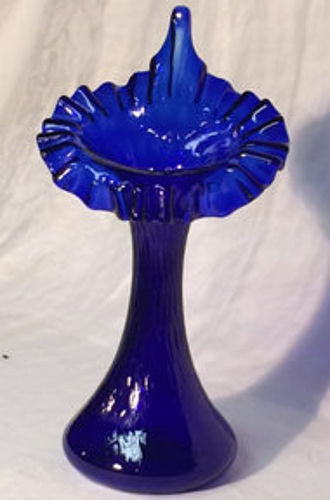 Fenton made this Colonial Blue Thumbprint 34 oz. Pitcher from 1964-73. It is in mint condition. Fenton Colonial Blue Hobnail Slipper is 5.5" long. Originally used as Individual Ashtrays. In mint condition. Made in the early 1960's. Fenton made this Colonial Blue Thumbprint Creamer and Sugar from 1964-73. Original lid!! It is in mint condition. Fenton Colonial Green Thumbprint 10 oz. 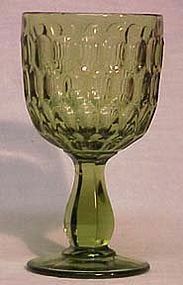 goblet was produced from 1969-74. It measures 6.5" tall and is 3.5" across the top. In mint condition. Only one is available.